This December 2014 article sheds light on the flimsy evidence pertaining to the conviction of Dzhokhar Tsarnaev for his role in the Boston bombings. Dzohkhar faces life imprisonment or the death penalty. Relevant sections are highlighted. The Boston Marathon bombing is much more important than has been acknowledged, principally because it is the defining domestic national security event since 9/11—and has played a major role in expanding the power of the security state. For that reason, WhoWhatWhy is continuing to investigate troubling aspects of this story and the establishment media treatment of it. We will be exploring new elements of the story regularly as the January trial of accused co-conspirator Dzhokhar Tsarnaev approaches. 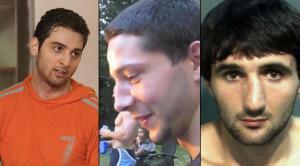 All dead: Tamerlan Tsarnaev, 2011 murder victim Brendan Mess, Ibragim Todashev. By WGBH. For nearly any crime requiring a “Whodunnit” answer in Boston around the time of the April 15, 2013, Marathon bombing, the authorities answered: The Tsarnaev brothers. One egregious crime pinned on them was a grisly Sept. 11, 2011, triple murder in Waltham, Mass. Now, prosecutors in the trial of Dzhokhar Tsarnaev have delivered a shocking reversal. They admit to having no evidence that his dead brother, Tamerlan, was involved in the slayings. That wasn’t the case right after the bombing: law enforcement fingered Tamerlan as the perpetrator, and suggested Dzokhar may have been involved. Much of the media has presented it as fact ever since. This is a pattern we’ve seen since the bombing: The government feeds prejudicial information (usually anonymously) to the press, implying Tamerlan and Dzhokhar’s guilt, despite having flimsy or no evidence. In the most extreme example, prosecutors had to completely recant their accusation thatthe brothers robbed a 7-Eleven. The Waltham triple murder case got the same treatment. Within weeks of the bombing on Boylston Street, law enforcement officials confidently proclaimed they had a “growing” amount of “forensic evidence,” along with a written confession from a now-dead friend of Tamerlan’s, that implicated Tamerlan in the Waltham slaying. But now, the government admits that, other than the confession, it “has no evidence that Tamerlan Tsarnaev actually participated in the Waltham murders.” And it turns out that the damning confession has some serious holes in it too. So, what happened? First, a little history. On Sept. 12, 2011, the bodies of Brendan Mess, 25; Erik Weissman, 31; and Raphael Teken, 37; were discovered in Mess’s Waltham apartment, their throats slashed, with pounds of marijuana and thousands of dollars in cash scattered over them. Investigators immediately assumed that these murders in a small suburban community outside Boston likely involved some type of illicit drug dispute. But the trail to the perpetrators of the triple homicide soon went cold—until the Marathon bombing. While the public was still riveted by wall-to-wall news coverage of the bombing, law enforcement began to speculate about the Tsarnaevs’ involvement in the slayings. Tamerlan had been friends and an occasional martial arts and boxing sparring partner with one of the three victims, officials told the media. But the government’s own story called into question the behavior of law enforcement officials in the same case. Despite the fact that Tamerlan’s link to the murder victims was known then, it appears he was never questioned about the crime. This is just one of the many inexplicable mysteries surrounding Tamerlan’s pre-bombing relationship with authorities. The Boston bombing somehow changed everything. Eight days after the attack, the Boston Globe first reported the possible link, and sourced it to an unnamed relative of one of the victims. The families of the victims asked that the investigation be reopened in light of the bombing. An ABC news report three weeks later upped the ante: Law enforcement had “forensic evidence” tying the brothers to the slayings, the network said, quoting unidentified Massachusetts investigators. But how solid was this evidence linking the Tsarnaevs to Waltham? All but nonexistent. We know that because Dzhokhar Tsarnaev’s defense team in the bombing trial asked prosecutors to share the proof they had of Tamerlan’s involvement in the Waltham murders. Why does Tamerlan’s participation in a murder have anything to do with his younger brother’s trial for a wholly separate crime, the Marathon Bombing? The defense is trying to gather proof that Tamerlan dominated his younger brother, which would help Dzokhar’s arguments against the death penalty. Presiding Judge George O’Toole ultimately denied the defense request. Nonetheless, the answer the prosecution gave in court filings demonstrated one thing: that what was leaked to multiple news outlets as evidence was nothing more than innuendo. In terms of incrimination, all that’s left is the confession by the dead friend of Tamerlan’s, Ibragim Todashev. Which also appears, on close scrutiny, to raise more questions than it answers. In fact, Boston Magazine uncovered an important inconsistency in Todashev’s description of the crime scene that calls its legitimacy into question. Due to an improper redaction which made the confession public, the magazine was able to compare Todashev’s written description of the victims with what the first eyewitness encountered at the crime scene. When referring to the three victims, Todashev wrote in broken English that “we taped their hands up.” (Please see a photo of the handwritten confession here). But the first eyewitness to the gruesome scene, Hiba Eltilib, girlfriend of Brendan Mess, said otherwise: “None of their hands were tied as I recall,” she said in an interview. So here we have another example of the authorities’ early assertions about the Tsarnaevs looking suspiciously shaky under close scrutiny. The Tsarnaevs’ imputed connection to the Waltham murders rests on nothing but a questionable confession by a friend — a man who was later shot down by an FBI investigator while being interrogated. And dead men tell no tales. Meanwhile, as so often happens in these high-profile cases, the initial allegations are still widely circulating in media accounts, while the later, potentially exculpatory information barely registers in the mind of the public. Certainly there’s a lot of pressure on public officials to solve particularly horrific crimes like the Waltham murders. But a year-and-a-half after the government’s confident claims of Tamerlan’s guilt, we’re finding out that what they really have is next to nothing. Can this rush to judgment be blamed on expediency, wishful thinking, or something else?